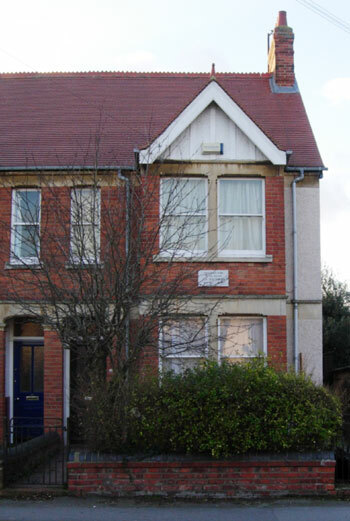 Clive Staples Lewis had associations with Headington from June 1921, and it was his permanent home from 1929 until his death in 1963. Even after he had left Magdalen College, Oxford and became a fellow of Magdalene College in Cambridge, he regularly returned by train to Headington for weekends and vacations. Mrs Janie Moore (née Askins), known as Minto, born in Ireland in 1872, led the way to Headington. She was the mother of a comrade of Lewis who had been killed in the First World War and separated from her husband, and in the autumn of 1918 moved to Oxford with her daughter Maureen in order to live near Lewis: they first lived in Warneford Road, and after several other short lets moved to Headington in June 1921: to “Uplands” at 54 Windmill Road, in the parish of Holy Trinity, Headington Quarry. Lewis visited Mrs Moore frequently after her move to Oxford, and regarded her as his adopted mother, but scholars have suggested that there was more to the relationship than this, even though she was 26 years his senior. In about 1923, Mrs Moore and her daughter moved with C.S. Lewis to another house in Headington: “Hillsboro House” on the west side of Holyoake Road in the parish of All Saints’, Highfield (below, photographed in September 2013). 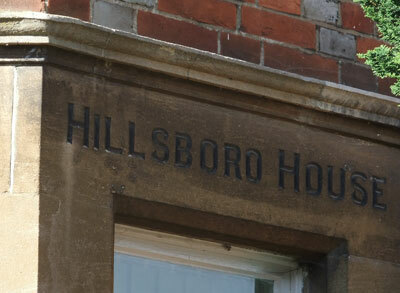 The address of Hillsboro House used to be 2 Western Road, but it is currently 14 Holyoake Road. Mrs Moore can be seen listed here in Kelly’s Directory for 1928, the first directory that covers Headington fully. Hillsboro House was for many years the Oxford Chiropractic Clinic. In 2013 it was put up for sale as development land. The odd thing was that before God closed in on me, I was in fact offered what now appears to be a moment of wholly free choice. I was going up Headington Hill on the top of a bus. Without words, and almost without images, a fact about myself was somehow presented to me. I became aware that I was holding something at bay. I felt myself being given a free choice. I could open the door or keep it shut. I chose to open. In 1929 he became a monotheist, and finally a Christian in 1931/2. At first Lewis’s brother Major Warren Lewis (known as Warnie) would have nothing to do with Janie Moore; but in 1929 after their father died Lewis persuaded Warnie to buy “The Kilns” together with him and Mrs Moore, and in 1930 C. S. Lewis moved there with Mrs Moore and her daughter. The ownership of The Kilns was put in Mrs Moore’s name, even though the Askins estate had borne less than half the cost and Lewis and his brother paid the rest. When Warnie retired in 1932, he also came to live with them, and Alice Hamilton Moore (no relation, but an old friend of Mrs Moore’s from Ireland) also lived there. The extensive grounds of this house, which was then out in the country, provided the inspiration for the Chronicles of Narnia, which started off as a tale told to children evacuated there from London in 1939. The Lion, The Witch, and The Wardrobe was published nine years later in 1948. The Kilns is in the parish of Headington Quarry, and Lewis attended Holy Trinity Church there with his brother. He first preached there on 29 March 1942, on the subject “Religion and pleasure”. Warnie served Churchwarden at Holy Trinity from 1953 to 1956. The brothers always sat in the same pew there, beside the pillar to St George. The Narnia window (left), designed and made by Sally Scott, was installed beside this pew in 1991. 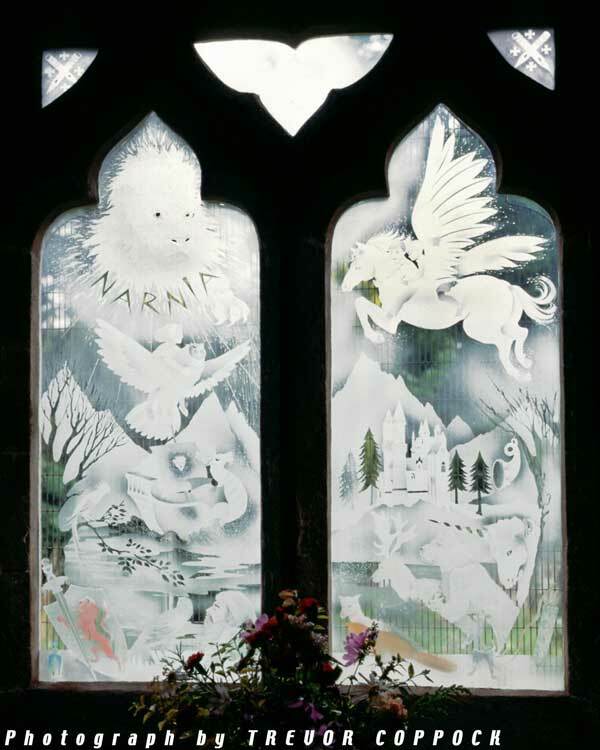 On the left, the window depicts Aslan the Lion as the sun, with the word NARNIA in the rays of light coming from his mane. On the right are the flying horse, the castle Cair Paravel, and a talking tree. Mrs Moore’s friend, Alice Hamilton Moore, died at the age of 85 and was buried at Holy Trinity Church on 6 November 1939. Mrs Moore herself died on 12 January 1951 and was buried in the same grave. Lewis accepted the Chair of Mediaeval and Renaissance Literature at the University of Cambridge that year, but continued to keep “The Kilns” as his home. 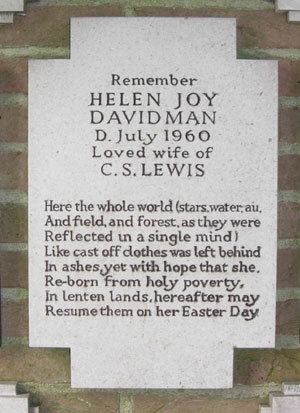 In 1952 Lewis met Mrs Joy Gresham (née Davidman), and their story is famously told in the film Shadowlands. Joy was an American who had been deserted by her husband. 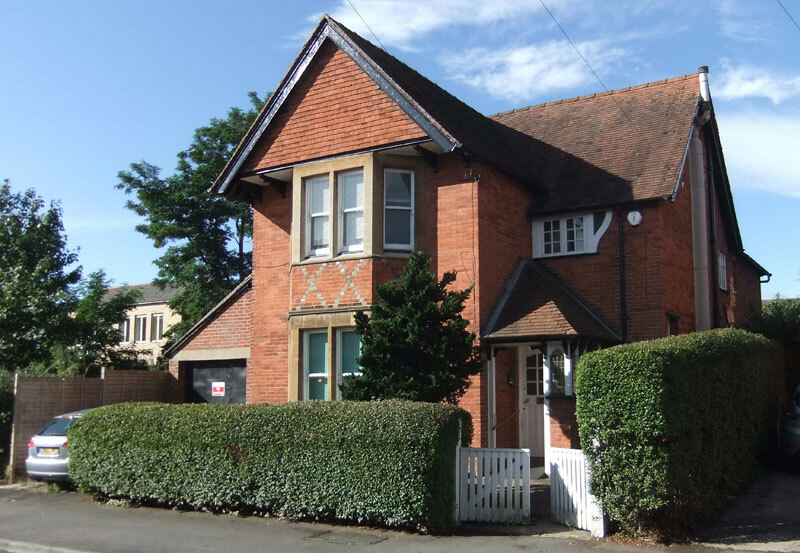 Lewis helped her to arrange the rental of 10 Old High Street, Headington (right) for herself and her two boys, and she moved in during August 1953. The house (opposite the present Waitrose) has a plaque over the downstairs window reading: “The former home of the writer Joy Davidman, wife of C. S. Lewis”. 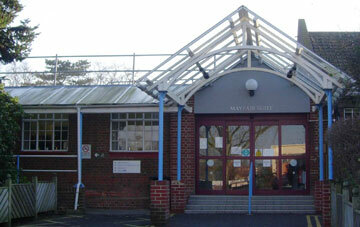 In 1957 Joy was admitted to the Wingfield Morris Orthopaedic Hospital (now the Nuffield Orthopaedic Centre) with a broken leg, and was found to have cancer. The Revd Peter Bide married Lewis and Joy a second time at this hospital (this time with a real Christian ceremony) on 21 March 1957: the marriage took place in the Mayfair Suite (left). The next month Joy moved into “The Kilns” with Lewis. During Lewis’s final illness, Father Ronald Head, the Vicar of Holy Trinity Church, visited him twice a week to administer communion. Lewis died at “The Kilns” on 22 November 1963 and was buried at Holy Trinity churchyard in a very plain grave (left). The quotation on the grave, “Men must endure their going thence”, is taken from King Lear: Lewis's mother had a calendar with a Shakespearian quotation for each day of the year, and that was the one on the day she died. Prof. C. S. Lewis, who was Fellow and tutor at Magdalen College, Oxford, from 1924 to 1954 died on Friday at his home in Headington Quarry. Until his resignation last month because of ill health he was Professor of Medieval and Renaissance English at Cambridge University. 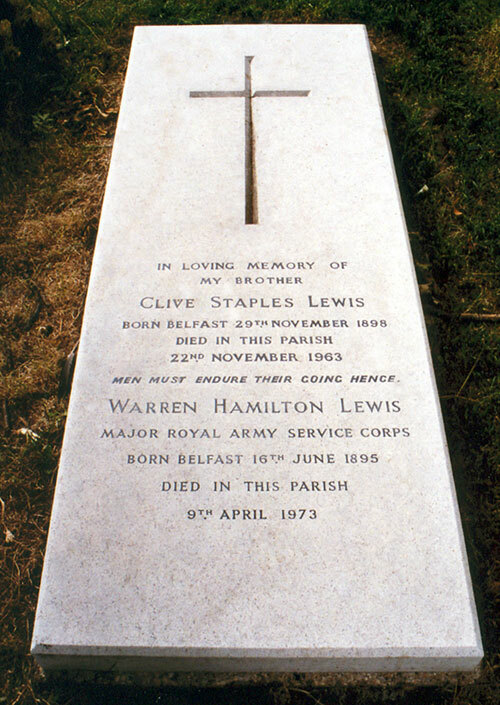 The son of a Belfast solicitor, Clive Staples Lewis served as a second lieutenant in the Somerset Light Infantry in France towards the end of the First World War. In 1918 he went up to University College, Oxford. He was best known outside the university for his books, especially his apologies for Christianity - among them The Screwtape letters. His brother Warnie remained in the house until his death on 9 April 1973, and was buried in the same grave his brother. “Jack never minded looking a fool in a good cause. My sister-in-law tells me that he used to attend an annual party in Headington where guests were expected to arrive, not exactly in fancy dress, but to suggest some topic the hostess had decided upon. After Jack’s marriage to Joy, he brought her along, obviously much to her disgust. She had chosen not to represent some character in Poetry or Opera…. Lewis (of course) represented Wotan, wearing a black eye-shade over one eye — without embarrassment.